Setting fire to the Kuja Sinan mosque in the Rhinkendorf (Reinickendorf) district of Berlin on 10/03/2018 is one of a series of ongoing attacks on Islamic facilities in Germany, which in the past two months alone have amounted to 44 attacks. The firm response by politics and the media, which we are used to when it comes to material work for a political purpose, was absent this time. The general and loose phrases that came out of the mouths of the politicians commenting on the event made the Muslim community concerned about an uncertain future and wondered: Is the German state really keen to preserve the lives and souls of its Muslim citizens? Neue Osnabrücker Zeitung newspaper reported that the volume of violence against Muslims and their meeting places can be seen from the response of the German Interior Ministry to a question posed by the left-wing bloc in parliament. 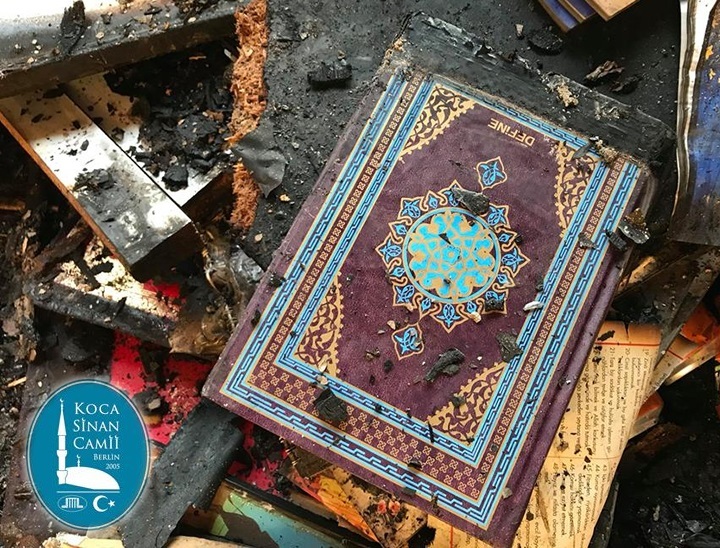 According to the report, in 2017, there were 950 attacks on Muslims or on places related to the Muslim community, such as mosques, and 33 people were injured. “The apparatus alone recorded 66 attacks: abusive graffiti, violations of the sanctity of mosques and other places staining them with pig‘s blood … In most of these incidents the perpetrators were right-wing extremists … The recorded crimes included incitement against Muslims or Muslim refugees online, threatening messages, assaults on veiled women or Muslim men in the streets, as well as material damage and Nazi writings on homes and mosques.” In addition to this, according to the statements of the German Interior Ministry, in the same year, there were 2219 attacks on asylum seekers and their places of residence: 1906 attacks on refugees, 313 raids of their residential centers and 300 people were injured. These violent acts against Islam and Muslims were supposed to spark a clear solidarity campaign with the Muslim community and a reconsideration of the integration policy practiced by the government for years. Instead, Burkard Dregger, a spokesman for the Christian Democratic Union Bloc in Berlin and an internal affairs expert in a press interview in front of the burned mosque of Kuja Sinan, asked the Muslims to “tolerate hatred, insults, defamation, and to stop complaining and showing discontent.” He believes that there is no role for the German media in spreading hatred against Islam. When asked about the statistics of the Ministry of the Interior, he said: “I do not know these figures…in every press meeting, these numbers are increased by adding zero at the end … I think we have to rely on the facts”. In addition, inflammatory signals have been sent by other political parties that have led to more strain in relations with Muslims. Interior Minister, Horst Seehofer, said on 16/3/2018 that Islam is not part of Germany. “The Muslims who live here are, of course, part of Germany, and that does not mean that we have abandoned our traditions and customs on the basis of wrong consideration.” While the buildings of Muslims and refugees are attacked on a daily basis. The Interior Minister is fooling the public opinion into thinking that the very existence of Muslims in Germany threatens German culture of collapse. The role of the victim invented by Seehofer inforces irrational fears and encourages those who see themselves as “protectors of the West” and gives them moral legitimacy, and the belief that their violence towards Muslims is only self-defense. Merkel’s often-cited argument that Islam is now “part of Germany” is no less dangerous. It stems from the same ideal illusion of a uniform society. In a televised debate on 3/9/2017, the chancellor specified her saying with a critical condition: “But it must be an Islam that is in line with the constitution.” Although the first paragraph of Article 4 of the German Constitution guarantees religious freedom and freedom of belief even if the belief was in contradiction to the constitution, most activists in political parties demand that Muslims focefully believe in the constitution as a condition for the process of integration which has been transformed from guidlines into a repressive process. The demand for a forced belief created by the former Minister of the Interior (Otto Schily) has created a rift between the majority of the society and the Muslim community. And its repercussions are felt in all strata of society. The danger of this thought to societal politics stems from the fact that it establishes a condition for peace and co-existence: the existence of a single doctrine in society. Thus, the conflict between viewpoints is inevitable and does not end until there is only one belief left. This intellectual image creates in society the feeling that Muslims in Germany are systematically and diligently working to destroy the present system and replacing it with their system. This Schily principle provides a fertile political ground for an irrational defense position against anything that can be linked even remotely with Islam. The natural consequence of this wholistic process of integration, which leaves no room for any other convictions, is hatred, incitement and violence against Muslims and their places of worship. In light of all this, Hizb ut Tahrir calls on all influential parties to change course and firmly. We srongly warn of a policy that was thought has been overcome; a policy through which ideas and people are exterminated in favour of a particular point of view. Instead of questioning the legality of the existence of an Islamic life in Germany and the desire to abolish it, Hizb ut Tahrir calls for the abolition of this failed policy of integration with all its dire consequences. To stop growing extremism in German society, an alternative model of co-existence must be designed, which fully accepts the existence of different convictions and does not consider it a threat to its own way of life.